And I, when I am lifted up from the earth, will draw all men unto me. Ascension Day is possibly the most forgotten of the great feasts of the Lord. Why? In part because, unlike all the other feasts of the same rank, it can never fall on a Saturday or Sunday. Forty days after Pascha is always a Thursday, and midweek services during the Paschal season are not very popular. Not only is this feast neglected, though, it is often mischaracterized as one of emptiness, a feast of absence and waiting. It is sometimes described, even in sermons and articles, as an “in-between” feast, an awkward nine days in which, while we must sadly give up the triumphant hymns of Pascha, still we are not yet granted the verdant warmth of the Holy Spirit. It’s seen as a corridor joining two spacious and beautiful halls, but itself containing little that is noteworthy, aside from the virtues of patience and hope. To be sure, this is a feast of patience and hope. The hymns in the Pentecostarion bear witness to this, as do the parting words of the Lord to his disciples: “Stay in Jerusalem until you are clothed with power from on high” (Lk. 24:49). Yet according to the Scriptures, they returned to Jerusalem “with great joy” (ibid., v. 52). Theirs was not the sorrow of abandoned children but the joy of those who knew their master to be exalted and glorified, who saw the resurrection take on a greater fullness than it had had during the forty days since Christ’s arising. Enlightened by the Holy Spirit at Pentecost, the Apostles came to see the Ascension as the key that opens up the mystery of our salvation. They preached and wrote about it constantly. But in the Church today it is referred to rarely if ever throughout the year. We will take the Apostles as our guides as we endeavor to enrich our somewhat meager conception of this great act of redemption. “…He ascended into heaven and sits at the right hand of the Father.” The Ascension is not only a feast commemorating a past event, it is also a dogma which all the baptized are duty-bound to profess. This is made explicit in the Creed, and in that text it is coupled with an earlier phrase: “He came down from heaven … and became man.” As God, he descended from heaven and took on human nature, and as Man, he ascended to his Father and sat down next to him. The Psalmist sings of this in prophecy: “Coming forth as a bridegroom out of his chamber, he rejoiceth as a giant to run his course. His going forth is from the uttermost part of heaven, and his circuit even unto the end of it again” (Ps. 18:6–7). St. Paul speaks of the same “circuit”: “In saying, ‘He ascended,’ what does it mean but that he had also descended into the lower regions of the earth? He who descended is the same who also ascended far above all the heavens, that he might fill all things” (Eph. 4:9–10). It is no exaggeration to say that the feasts of Annunciation and Christmas have their exact counterpart and, indeed, their fulfillment in the Ascension. Christ united himself to our nature in order to raise us up to God. The Word became flesh and made his home among men, but through the Ascension, “the head of our human race is at home, where only God is at home.”1 And he ascended, not to abandon the earth—much less his flesh—but to fill all things with himself. The eternal Word of God took on our human substance in order to become the “firstborn of many brethren,” in whom we are all adopted as children of God (cf. Rom. 8:16, 8:29). As the first-born, in obedience to the Law, forty days after his birth from the Holy Virgin the infant Jesus was presented at the earthly Temple of his Father, where two turtledoves were sacrificed in his stead (Lk. 2:24). Likewise, forty days after his Resurrection, having given himself over to death, Christ, the “firstborn from the dead,” offered himself and all his sufferings before the throne of his Father in heaven, so that, “as the head of the body, he might in all things have the preeminence” (cf. Col. 1:18). We thus see in the Ascension the ultimate goal of the Incarnation, the completion of the work begun at Christmas. But we can say more: it is the fulfillment of Holy Friday as well. The Ascension to heaven is the final priestly act of the sacrifice made upon the Cross. The late Fr. 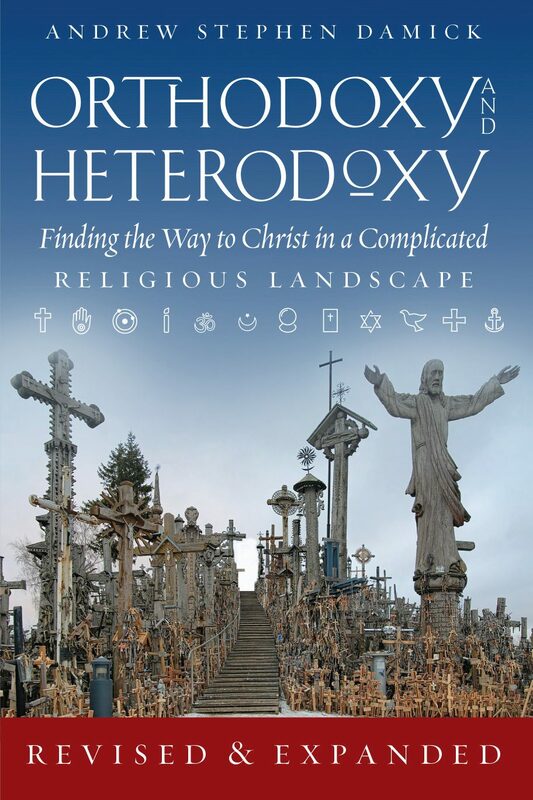 Matthew Baker notes that in much Orthodox theology of the twentieth century, “understanding of traditional atonement language has been obscured by confessional polemics and by the influence of modern existentialism, with its antinomian tendencies.”4 Recovering a full theology of the Ascension requires a corrective, because so much depends on Christ’s fulfillment of the Old Testament priesthood and sacrifices. In the Old Covenant, the high priest entered once a year into the Holy of Holies of the Tabernacle (later, the Temple), to offer the blood of a bullock and a goat (cf. Leviticus 16). He offered only the blood: the rest of the sacrifice was burnt outside the camp (Lev. 16:27; cf. Heb. 13:13). These actions prefigured and prepared for the perfect High Priesthood of Christ. Sacrificed outside the city walls of Jerusalem, his priestly work was not completed until he entered “into heaven itself, now to appear in the presence of God on our behalf” (Heb. 9:24), “taking not the blood of goats and calves but his own blood, thus securing an eternal redemption” (ibid., v. 12). Christ’s Ascension to heaven is thus the completion of his priestly office begun on the Cross. Bringing his own lifeblood—the human blood he took from his Mother, the daughter of Adam and Eve—he made the offering of human life which Adam failed to make in Eden. Mankind is saved not simply by the shedding of Christ’s Blood on Calvary, but by the presentation of that Blood in intercession for us before the Throne of God. “For there is one God, and there is one mediator between God and men, the man Christ Jesus, who gave himself as a ransom for all” (1 Tim. 2:5–6). The Apostle’s emphasis here on Christ’s Manhood and on his priestly mediation on behalf of men before the Father are accents not stressed in much Eastern theology and hymnography in the aftermath of the Arian heresy, given the pressing need to safeguard the Orthodox teaching of Christ’s perfect Divinity and consubstantiality with the Father. But these themes were never entirely lost, since they are eminently Scriptural and Patristic, and rediscovering them is key to our full understanding of the Ascension. Christ is both Priest and Victim. He offers the sacrifice, and he is the sacrifice. “Entering into heaven itself,” Jesus’s Blood speaks “more graciously than that of Abel” (Heb. 12:24). As Priest, he carries the sacrificial Blood with him not in a vessel, but in his own resurrected and glorified Body, the wounds in his hands and feet and side shining in splendid testimony to his having drained the cup of death. “Who is this that comes from Edom, in crimsoned garments from Bozrah, he that is glorious in his apparel?” In these words from the second reading appointed for Ascension Vespers, Isaiah speaks in prophecy of the Angels’ wonder when they see their Master return to heaven, not only bearing human flesh, but bearing also the marks of his Passion. He answers them: “‘I speak of righteousness and saving judgment. I am full of trodden grape, I have trodden the wine press utterly alone, and from the peoples no one was with me’” (Is. 63:1–3). St. John the Theologian, in his vision on Patmos, saw “a Lamb, as though it had been slain,” standing at the throne (cf. Rev. 5:6). This selfsame Lamb is present on the altars of our churches, “as on a cherubic throne,”5 because the Divine Eucharist makes present, in particular places on earth, the mystery of the one Priesthood of Christ and his perpetual mediation for us in heaven. By calling the Liturgy a sacrifice, we do not mean that the one, unique, and perfect sacrifice of the Cross could be repeated (cf. Heb. 10:10–18), but that in the Liturgy our offerings of bread and wine—of our lives and livelihoods—are united to that one perfect Sacrifice, which is made present to us. In this way Christ unites us to himself, as the body to the head, and presents us to his Father, who, in him, has become our Father as well. When the bishop or priest enters the sanctuary at the Divine Liturgy, he is acting in his role as head of the community, because he is an icon of Christ. Where the Head is, there also is the Body. In ascending from the Mount of Olives into heaven, Christ, who is for all eternity consubstantial with the Father and the Holy Spirit, also remains consubstantial with the race of men. He retains his human nature and thus could say to his disciples: “I go to prepare a place for you” (Jn 14:3). In the Liturgy, and ultimately in the Age to Come, we are given a way to approach God with boldness, “a new and living way which he opened for us through the curtain, that is, through his flesh” (Heb. 10:20). Remaining disciples of the ascended Christ thus involves a challenge: “If then you have been raised with Christ, seek the things that are above, where Christ is, seated at the right hand of God. Set your minds on things that are above, not on things that are on earth” (Col. 3:1–2). So it is our task to “lift up our hearts” not only during the Liturgy but throughout our daily lives. This is challenging, among other reasons, because in this life we are not yet able to see perfectly. We know that Christ is the Way to the fullness of life, but the destination has not been fully revealed. Christ, by his flesh, has made a way into the Holy of Holies, but “the cloud received him out of their sight” (Acts 1:9). And thus also in our churches, the altar is veiled, the sanctuary is hidden. But the iconostasis at the same time reveals, allowing us to perceive more deeply than we could without it. Without the cloud, what might the disciples have seen? Would they have seen their Master become smaller and smaller, like an airplane, and then finally disappear? The cloud showed them something greater, though harder to understand: the Throne to which Christ was exalted is not a place relative to our location in space. We moderns might suppose that the Apostles and Fathers couldn’t have understood this, never having peered into vast galaxies without seeing anywhere the Throne of God. Christ’s human body, now hidden from our physical eyes for a time, will be revealed again in majesty when he comes again as Judge. The angels made this clear to the Apostles as they stood gazing up into the sky that first Ascension Day (cf. Acts 1:11). When he returns, still bearing the marks of his Passion, those who loved darkness rather than light “shall look on him whom they pierced,” and shall mourn (cf. Zech. 12:10). The Second Coming, followed by the Universal Resurrection of every human being, the Judgment, and the inauguration of the Age to Come—this will be the final triumph of Christ’s salvific work, in which not only the heavens are sanctified by Christ, but the earth also, and the entire cosmos, is to be transformed, renewed, and glorified (cf. Rom. 8:22, Rev. 21:1). In the meantime, though, Christ remains with us “even unto the end of the age,” in a hidden, mystical manner, through the Church and the Eucharist. In this life of pilgrimage, Christ strengthens us by his abiding Presence with us in the Church, as the Tent of Meeting accompanied the Israelites in the desert, and he feeds us with true Manna from heaven: his living and deified Flesh and Blood. In passing from Ascension to Pentecost, then, we move not from emptiness to fulness but rather to a deeper understanding of the fulness that was already there. That is, the Holy Spirit is sent to reveal Christ. On the Day of Pentecost itself, St. Peter preached about Christ and about his exaltation to the right hand of the Father (cf. Acts 2:33–35). The Holy Spirit reveals that Christ now reigns in glory, that he “ever liveth to make intercession for us” (Heb. 7:25), and that he is preparing a place for us. We see the work of the Spirit very clearly during the brutal stoning of St. Stephen the Protomartyr: “Full of the Holy Spirit, he gazed into heaven and saw the glory of God, and Jesus standing at the right hand of God; and he said, ‘Behold, I see the heavens opened, and the Son of man standing at the right hand of God’” (Acts 7:55–56). Above all, it is the Holy Spirit who works in us the adoption of sons, crying out in our hearts, “Abba, Father!” (Rom. 8:15). Anointed by the Gift of the Holy Spirit, we are made strong and readied for spiritual battle, as we grow “unto the measure of the stature of the fullness of Christ,” (Eph. 4:13). And so it is the Holy Spirit who prepares us to be co-enthroned with Christ on the throne of God. “To him who conquers will I grant to sit with me on my throne, as I myself conquered and sat down with my Father on his throne” (Rev. 3:21). Because of the Ascension, we know that Christ will reign “until he has put all his enemies under his feet.” “Then comes the end, when he delivers the kingdom to God the Father after destroying every rule and every authority and power” (1 Cor. 15:24–28). And God shall be all in all. Fr. Patrick Reardon, From a sermon recorded on the Sunday after the Ascension. For a brief discussion of predominant “theories of the Atonement” in modern Orthodox theology, see Matthew Baker, “Atonement in the Theology of Fr. Georges Florovsky,” in Matthew Baker, Seraphim Danckaert, and Nicholas Marinides, eds., On the Tree of the Cross, Jordanville: Holy Trinity Publications, 2016, especially pp. 121–126. Homily 16.24, 31; Christopher Veniamin, trans. Saint Gregory Palamas: The Homilies 2nd ed., Waymart: Mount Thabor Publishing, 2016, pp. 125, 128–9. From the Presanctified Liturgy, the Prayer after the Great Entrance. Alexander Schmemann, The Eucharist: Sacrament of the Kingdom, Crestwood: St. Vladimir’s Seminary Press, 1987, p. 60. Maximus Confessor. Mystagogy, in Selected Writings. New York: Paulist Press, 1985, p. 198. Germanus of Constantinople. On the Divine Liturgy. Paul Meyendorff, translator. Crestwood: St. Vladimir’s, 1984, paragraph 24. On the Orthodox Faith, 4.2. Quoted in Douglas Farrow, Ascension Theology, New York: T&T Clark, 2011, pp. 44–45. Hieromonk Herman (Majkrzak) is a member of the Brotherhood of St. Tikhon's Monastery, South Canaan, Pennsylvania, and a liturgical editor for St. Tikhon's Monastery Press. Thank you for this very helpful article. It brings forth two questions related to the ascension I have been pondering for years! I will state them as straight forwardly as possible: What exactly was finished when Jesus said ‘it is finished’ while on the cross. What wasn’t finished? The second is was the ascension a necessary precursor to the procession of the Holy Spirit? Is there any connection with the ‘last days’ (and the filioque controversy)? Thanks for these questions. St. Leo the Great comments on “It is finished” thus: «Having now tasted the vinegar, the produce of that vineyard that had degenerated in spite of its divine planter and had turned to the sourness of a foreign vine, the Lord says, “It is finished,” that is, the Scriptures are fulfilled. There is nothing more to endure from these raging people. I have endured all that I foretold I should suffer. The mysteries of weakness are completed. Let the proofs of power be produced. And so he bowed the head and yielded up his spirit and gave that body that would be raised again on the third day of the rest of peaceful slumber.» Sermon 55.4. On your second question, the Lord himself says that “if I go not away, the Comforter will not come unto you; but if I depart, I will send him unto you.” It seems to me that, among other things, this means that Christ’s saving work had to be completed before the Holy Spirit was to come and (as I said in the article) reveal this work (in its completeness) to the eyes of Christ’s disciples. Also, for Christ send the Holy Spirit, he himself had to have been exalted to the throne of God, where the Spirit dwells. Don’t confuse this with the Filioque, though. The Filioque posits an *eternal* procession of the Holy Spirit from both the Father and the Son — that is, it concerns the relationship of the three Persons of the Holy Trinity in themselves, not with respect to man or creation. In the economy of salvation, by contrast, it is the Son who sends the Holy Spirit upon mankind because it is the Son who became Man, and who was himself anointed with the Holy Spirit (hence his title “Christ” or “Messiah” — anointed one). I am edified by this article. Thank you. It helps me to see the statement that the Christ is the Author and Finisher of our faith in a new light. Was not our faith authored in the Passion and Resurrection and finished at the Ascension? Thank you Hierodeacon Herman for giving us reason to reflect on this “forgotten” Great Feast! Thank you Hierodeacon for the good essay. These are the very themes so uniquely dominant in the Western “Orthodox” Liturgy as Fr. Reardon has pointed out on many occasions. We should mourn the loss of this rich and apostolic Liturgy and rejoice in it’s restoration to our Church through the Western Rite established by Saints, Synods, Patriarchs, and Bishops. This Liturgical Tradition is not an old shoe lost in the attic it is Living and Spirit breathed and it’s restoration should be celebrated for how it enriches us. I hope you will forgive my shameless opportunism in using your fine article to make my remarks! Fr. Patrick, thank you for this comment. The formularies of the Western Rite do indeed retain many of the themes I sought to emphasize in this article, and their presence there is part of what has made me aware of them. I think intelligent churchmen will continue to disagree about the place of a restored Western Rite—or, indeed, its necessity—within the modern Orthodox Church. One of the things that makes me uneasy about it is precisely the need to for it to promote itself. In the pre-Schismatic Church, both East and West, one simply adhered to whatever was the local rite. The situation where there is a choice, and where one is invited to weigh and defend the plusses and minuses of different rites—this is truly novel. Where we can agree, though, is that knowledge and study of the Western Rite is a necessary part of a full theological education within Orthodoxy. Father, I think there might be room for more fruitful discussion on the topic of heaven and outer space. For the biblical authors, “the heavens” clearly constitute what moderns refer to as outer space: they include but also transcend the Sun, the Moon, and the visible stars. In Hebrew, Greek, and Latin, the words that we render “heaven” and their cognates are the words for the celestial phenomena. To my mind, the later Platonizing tradition, trying to push heaven further and further away from the rest of the cosmos, misses the biblical emphasis on heaven as part of the created order. God’s eschatological purification of the cosmos will include the shaking of heaven (Hebrews 12:27); the heavens are not a static, eternal realm, but a created and dynamic realm, apparently capable of suddenly passing away as the elements are burned in fire (2 Peter 3:10), in which the uncreated God nevertheless chooses to dwell. We have an antinomy here: God, on the one hand, transcends creation, and yet on the other hand the biblical description of God dwelling in the heavens is not a statement of divine transcendence, but of divine immanence, since this is still an example of God choosing to dwell in the cosmos. To my mind, translating the biblical cosmology into modern idiom does not demand a Platonic removal of heaven outside of the created space-time universe on the one hand, or an internalization of heaven as a state of the soul on the other, both of which are foreign to the biblical authors. For them, God chooses in his grace, love, and mercy to localize his presence in the heavens (which nevertheless cannot contain him) and from there to rule the rest of creation, including the earth. With the change in our cosmology that has been underway since Aristotle in the 5th century BCE, beginning first with the recognition of a flat earth and proceeding with contemporary astronomy, I see no reason why we could not say that somewhere in the cosmos, a place unknown to us and to which we are incapable of travel, God chooses to localize his presence in the universe and there chooses to reign, in the heavenly or celestial temple, until the day when the divine throne is moved from heaven to earth in the renewal of all things (Revelation 22:3). I obviously can’t prove this–of course, much of this is speculative! But I certainly prefer a heaven that is an actual place, in line with the biblical worldview but articulated in a way that shows clear awareness of the movement from ancient to Medieval to modern cosmologies, to a heaven that is simply an ideal realm or state outside of the created universe. Such a heaven makes sense to Plato, but little, I feel, to the writers of the Old and New Testaments. I believe the Ascension is the ultimate counterexample to the Platonic heaven: if Jesus Christ ascended bodily into heaven, then it stands to reason, and it was undoubtedly the assumption of the ancients, that he ascended into a place where space, time, and matter still exist and function; otherwise we would have to argue for a disincarnate ascended Christ, and that, as you so rightly note in this excellent blog, would be heresy. With Farrow, I agree with you, then, that modern cosmology cannot force us to reject a local heaven. And yet, with the Damascene, we must insist that right hand of the Father is uncircumscribed. How is this to be resolved? I don’t know! But with regard to your specific suggestion that the heaven to which Christ ascended might be located within the created universe, I think a few scriptural witnesses should be considered: “He that descended is the same also that ascended up far above all heavens” (Eph. 4:10); “And God placed all things under his feet and appointed him to be head over everything” (Eph. 1:22); and these from the Old Testament: “Thou hast set thy glory above the heavens” (Ps 8:1); and (particularly noteworthy as this feast’s prokimenon): “Be thou exalted, O God, above the heavens, and thy glory over all the earth” (Ps. 107: 5). The moon, the stars, all the “heavenly bodies,” are, as you rightly say, considered to be part of heaven in the scriptural understanding. But Christ, it seems, is far above all those, not among them. All things are put under him. And yet, Christ *is* in an actual place! Please give me your further thoughts. Blessed Feast of the Lord’s Ascension! 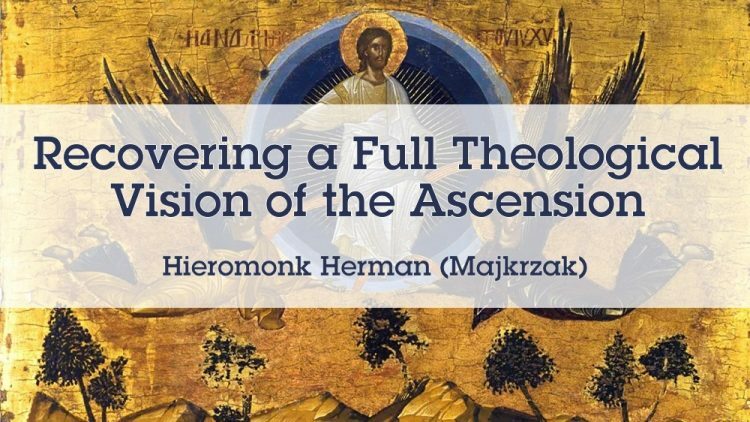 I was helped by this article as this feast has always presented a challenge to the faithful in understanding the Ascension’s fuller theological implications. To further facilitate this understanding, would you summarize in one sentence the themes of each section (ie. I, II, III, IV, V)? 3. Ascension and Christ’s heavenly Priesthood is the reality we participate in at the Divine Liturgy. Christ is enthroned in the Chalice on the Altar. Would that not then be the physical location of heaven? Dear S., yes and no. The kingdom of heaven is present in a mystical way in the Eucharist, as I briefly discussed in the article. But Christ’s human body, with “flesh and bones”, sinews, fingers and toes and face and heart, and even the very marks of the Passion, continues to exist, and continues to have a location. We believe that the Gifts at Liturgy are truly Christ’s Body and Blood, but by this we mean that they are *identical* to that human Body which was conceived by the Holy Spirit, was born of the Holy Virgin, suffered and died under Pontius Pilate, rose from the dead glorious and incorruptible, ascended to the right hand of the Father. Christ, and will come again as Judge. Put another way, the Kingdom is present in the Eucharist, but the Kingdom cannot be reduced to the Eucharist. Many thanks for a very helpful article! In the Creed we speak of Christ as SITTING at the right hand of God the Father. Proto martyr Stephen saw Christ STANDING…..
Marianne, that is an excellent observation. The Scriptures usually speak of Christ as seated at the right of the Father, as this manifests Christ’s Kingship: he is enthroned. St. Stephen’s vision of Christ ˆstandingˆ, shows his priestly role as intercessor. «The author of Hebrews illustrates this union of priesthood and kingship in Jesus in a striking way: the priesthood of Jesus is perfected in His enthronement. The sacrifice offered by Jesus is rendered perfect by His entrance, once and for all, into the Holy Place not made by hands (Heb. 9:11), in order “to appear in the presence of God for us” (9:24). This entrance into the heavenly sanctuary renders His sacrifice perfect, because “if He were on earth, He would not be a priest” (8:4). As I mentioned in the article, these two postures are reflected in Orthodox liturgical practice. The two poles, if you will, of the Orthodox sanctuary are the holy table and the throne. The bishop or priest spends most of the Liturgy standing before the holy table. However following the Little Entrance, there is a brief period when the bishop or priest *sits down* on the throne behind the holy table – or, in the case of a priest, slightly to the side. Thus the priest, as the image of Christ in the liturgical community, reveals both Christ’s priesthood and his kingship. Fr. Herman, do you by any chance happen to listen to the Theopolis podcast? I just checked it out; looks very interesting! Thanks for suggesting it.